Max and I were regular flyers PB (pre-baby). With vacations, weddings, and visiting family, I'd average a round-trip flight a month and he'd rack up way more with business travel. We never checked bags, would breeze through security, and enjoyed perks of frequent flyer programs. We had our own little very plush routine: we'd pre-board since Max always had status on at least one airline, read our books or magazines until takeoff, then we'd enjoy a laptop or iPad movie using our headphone splitter so we could watch at the same time. Flying was leisurely, and the biggest challenge we ever had was getting stuck behind someone slow in security. That all changed the day we welcomed our sweet baby boy into the world and realized that we'd soon be traveling with an infant. We'd be those people. The people we used to look at and pity, the ones flying with a baby. Upon booking our first flight (a short 1 1/2 hour ride to California to attend a wedding and see family), I immediately realized I had no idea about the logistics of flying with a child. Should we check the stroller or bring it to the gate? Does it go through the x-ray machine? Is it too big? Do we need Parker's birth certificate? What do we do with baby when we go through the metal detector? I wanted to know everything. With four baby-on-board flights under our belt now, I thought I'd share some of the tricks we've learned along the way, and simply share what to expect for anyone planning their first flight with baby! You can also add the "lap child" upon physically checking in at the airport. 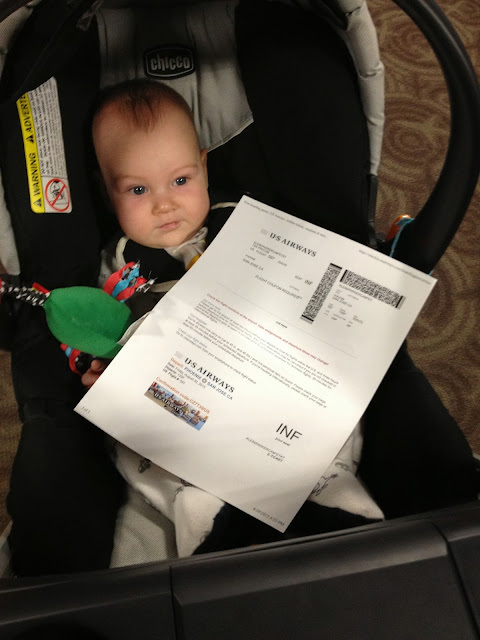 For most airlines, no birth certificate is needed at check-in unless the age of the child is in question (since Parker was 5-6 months when we flew we knew we wouldn't have a problem). However, Southwest Airlines does request to see a copy of the birth certificate when checking in (so far, it's the only airline we've encountered that does this). Choosing Seats: My tall husband loves to fly in Exit Rows as they give more leg room, however this is out-of-the-question when traveling with a baby. Bulkhead seats are still an option and we flew twice in this area. Bulkhead seats, however, have no room to store bags at your feet, so while it was nice to have the open space in front of us, bulkhead wasn't very practical for traveling with baby. I'd prefer to have all my things at arm's reach the entire flight, not just between takeoff and landing. 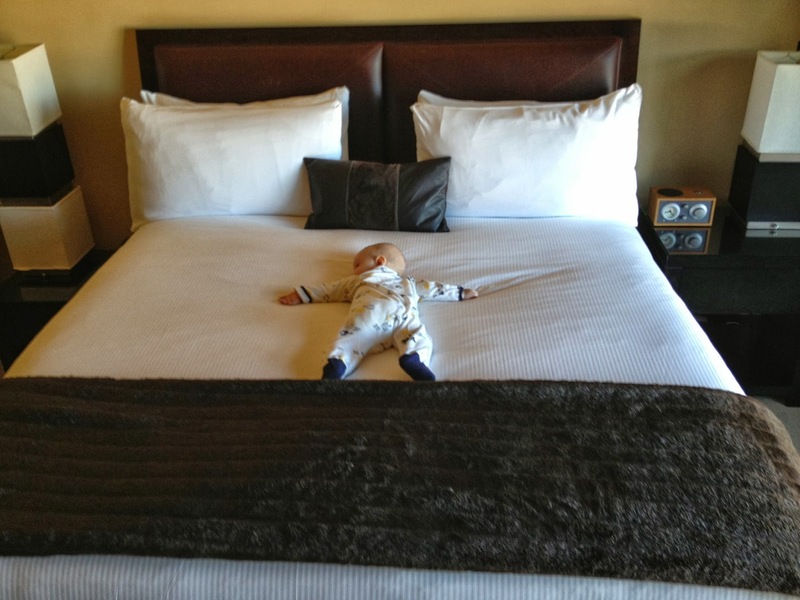 A trick that one of my new mom friends recommends is, when traveling as a couple plus baby, to book a window and an aisle seats. In her experience, half the time if the flight's not full, no one books that middle seat (and if they do they happily switch to window or aisle once boarding). For our Texas trip, we bought tickets using miles (thank you Max for racking up business travel points!). We had enough points to buy all three of us tickets (which would allow us to take Parker's car seat right onto the plane). Or, we could do two first class tickets with a lap child. I'm so happy we opted for the latter. If at all you have this option, take it! First class gave us tons of space, and lots of attention from flight attendants wanting to accommodate baby. They are available for both cars seats and strollers. We bought the one for the car seat and I'm so glad we did: on our way to Dallas we were caught in a huge rainstorm and the bag kept the car seat dry as it was being moved to and from the plane (not to mention it prevented it from getting dirty and banged up on the rest of the legs). Food: Ahhh, this used to mean the snacks I'd pack for myself! Hah! Now of course it means sustenance for little man. For our trip to California, we'd be leaving Parker my mom while we attended a wedding so we needed to bring milk and purees. I confirmed on TSA's website that the 2oz fluid limits do not pertain to baby items, so I chose exactly what I thought Parker would need. I kept the milk and the purees frozen, then the morning of our flight I packed them into a thermal lunch box and added a gallon sized ziplock of ice. This worked perfectly for our short flight (and replacing the ice at the airport or on the plane I think would work for a longer journey). Attire: Knowing that airplanes can get quite cold, we opted to put little man in long sleeves and pants for our flights (actually just his jams for a number of the flights since they fit the bill and they had footies to keep his toes warm!). My Mommy & Me yoga instructor keeps our classes warm since she says cold babies cry and warm babies just get tired and go to sleep. That was enough reasoning for us! Security: We arrived way earlier than we normally would have, knowing we had to check our bags and not wanting to feel rushed. When we got to security, we had the usual removing of shoes and belts and liquids to do, plus loading the diaper bag carry-on, and placing the car seat and stroller through the x-ray machine. TSA's official line is that the stroller goes through the x-ray machine "if it fits", but I will tell you they really want it to fit. If it doesn't, it adds a bunch of time on their part having to swipe it and examine it separately, so be prepared for them to insist that it go through! Ours actually fit no problem, however at this point I was very glad to have two sets of hands. Max loaded the car seat onto the conveyor belt as I held Parker and walked through the metal detector (we read that they do allow you to wear baby in a carrier, but if the metal detector goes off you'll have to be examined, so we just went sans carrier through the detector). Update: We know belong to the Global Entry Program. Global Entry allows for TSA pre-check, a separate, simpler way to go through security! It's totally worth every penny! Ready to Board: Since we always arrived early, we had plenty of time before it was time to board to put our Gate-Check bag on the car seat and pick up Gate-Check tags at the ticket counter for the car seat and stroller. You can also just check them there at the counter but we opted to keep them and walk them down to the gate as we were boarding and leave them there. 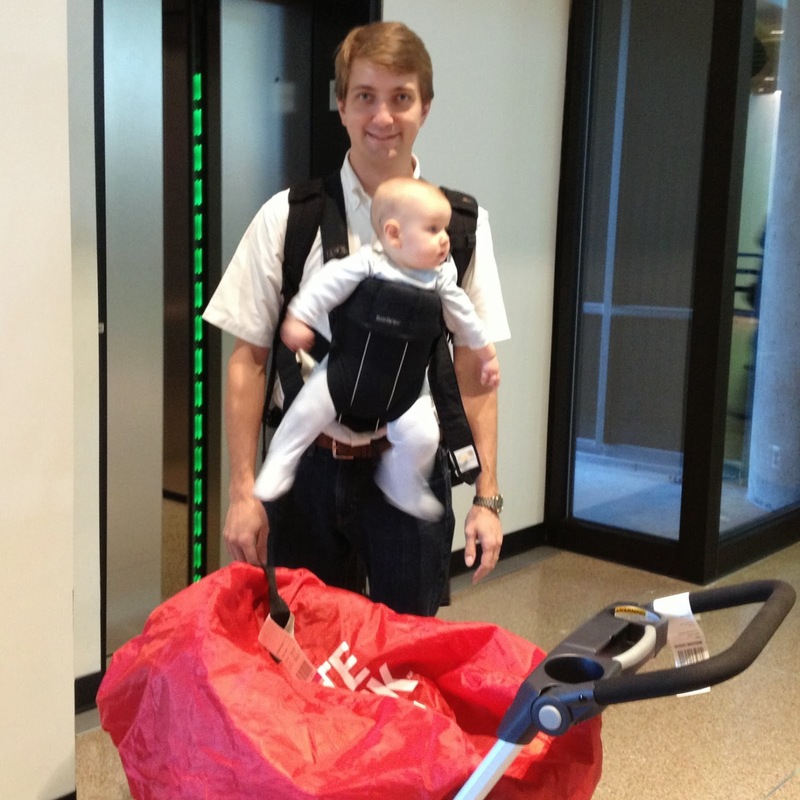 We definitely recommend bringing along a baby carrier so you can be hands-free! Boarding: We're used to pre-boarding, which is what we did with little man, however this adds time that you're actually sitting in your seat on the plane. Since we didn't have bags that had to be stored in overhead bins (a big reason to board earlier rather than later to make sure there's space), we really could have waited until the last minute to get on, to minimize the total number of minutes baby would be on the plane. Maybe next time. Take-Off: We read that having baby eat at take-off and landing helps to clear ears. Since Parker still refuses the bottle, I ended up nursing at take-offs and landings. This sometimes puts him to sleep, which worked great for flying! (Below he fell asleep before we even took off - we ended up having a 1.5 hour ground delay, lots of which he slept through!). Diaper Duty: I had major anxiety about changing baby on the plane. However, having done it now, I can say it's really not that bad! Just make sure the restroom you're using has a changing table (there should at least be one on the airplane and it will be marked on the door. Poor Max was on diaper duty during one flight and went to the first class restroom which had no changing table, so he basically changed our son in the sink?). Keeping Baby Happy: Before our California trip, I read somewhere that it's good to have an old, familiar toy as well as a new, different toy to keep baby busy. My mom friend recommended that we pack light, and that we'd rather find the things we needed easily rather than having an overstuffed bag. So we brought Parker's favorite toy (Sophie) and a couple rattle-type toys we hadn't brought out before, plus a board book. Our baby, however, still found his "outdoor" voice and wanted to scream and shriek while on the plane. Oh, dear. For Texas, we brought everything above plus we were prepared with the iPad. We're following the APA's advice to avoid screen time before age two (though we do make an exception for facetiming and Skyping with family and friends), however we figured we could break the rules on the plane if it meant a happy baby! At home, Parker loves to look at our fish tank, so Max found an app called Aquarium Live, which is basically just video of the ocean. Parker looooved sitting with daddy and watching it! 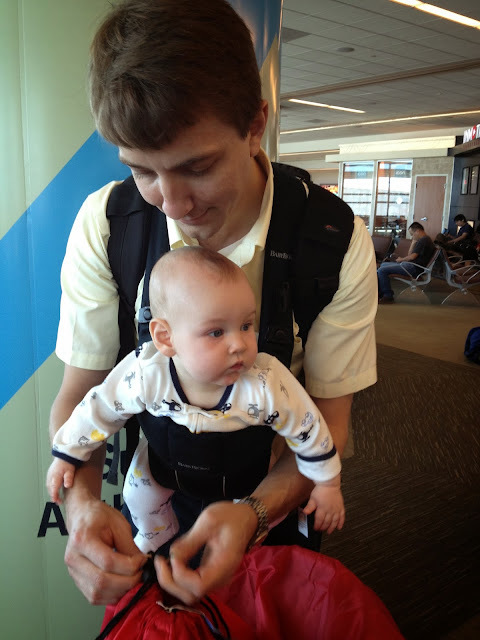 It worked instantly whenever he was starting to get fussy, a definite must for flying with baby! Little man loves to eat, so I also spent quite a bit of time feeding him (a full baby = a happy baby!). Landing: After we were on the ground, we hung out at our seats rather than trying to be first off the plane since we knew we'd have to wait for our stroller to be delivered (and not wanting to be rushed with baby). I'm not going to lie, I was exhausted after every flight! Parker actually got better with each one, though! We actually received compliments after our Texas flights - Go, Little Man! I love the iPad app! We are flying next week with our 12.5 month old. I'm totally terrified. :) I figure I can always lock myself in the bathroom with him while he screams. Thanks for sharing your tips! which helps people find the best baby backpack carrier Roy Johnson [https://twinbabycarriers.weebly.com/] and the perfect design that suits their preference.